Straddling the Canadian-United States border between Ontario and New York, the awesome Niagara Falls attracts millions of tourists every year. The visit makes for a spectacular day trip from Toronto. 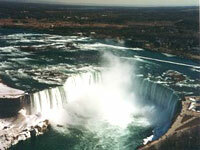 Indeed, there is plenty of action on the Niagara peninsula. Apart from appreciating one of the tallest waterfalls in the world (perhaps from a spray-filled boat tour), visitors can enjoy wine-tasting, skydiving, and spectacular helicopter rides above the thundering falls.